The paper pointed out that Salvado's stunning performance was a positive experience for the young musicians who attended, and went on to add that Mr Salvado's return to New Norcia (by foot, of course) was a "serious loss to the community". Music has always been great for bringing people together and creating communities, which is probably why Salvado's concert was so well received by both Protestants and Catholics, who shared a strong animosity at the time. The way music overcomes barriers is something that continues to be celebrated today in concerts, music festivals, and any contexts where friends come together to play music (like the wonderful PianoEasy group lessons). 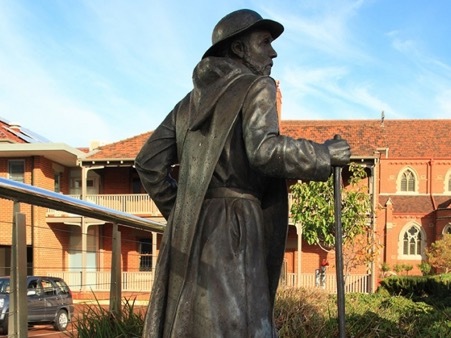 When Salvado had raised the funds he needed, he walked back to New Norcia, but it wasn't the last time he made that journey. In fact, if you leave the city of Perth and walk down Salvado Road, you can still see him travelling. Although he returned to Perth several times, he never gave another piano concert. His legacy is carried on today by the Benedictine monks in New Norcia and their musical skill, which they continue to share with the community in their weekend Mass.